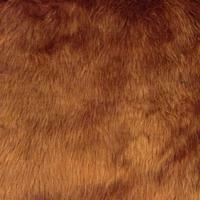 This is a basic fur in a pretty solid rust color. The fur has a pile length of approx. one inch and the fur is nice and thick with a good backing and nice drape. This is a fur that we have had a great deal of interest in as finding a solid rust color fur seems to have been an ordeal with our customers. Hopefully this fur will fill the void needed for many projects.